In the same week that saw students occupy the Colosseum and the Leaning Tower of Pisa, Italy today has seen more occupations, street battles and blockades of railway stations by students opposing new education reforms. Rome was brought to a virtual standstill by the Block Everything Day ahead of the vote on spending cuts and time limits on research. Students blocked roads and central squares in Rome, and hundreds surrounded the Chamber of Deputies as riot police maintained a tight cordon. Cars were unable to circulate around the city as other students blocked roads and major throughways. Thousands of students streamed through central Rome towards parliament, chanting and waving banners with slogans such as 'education is on its knees' and threw eggs, vegetables, bottles and fireworks towards parliament. Traffic was disrupted in other major cities, from Turin to Palermo, while students blocked the tracks at railway stations in Milan, Pisa and Venice. In Genoa, students protested under the slogan "they block our future, we block the cities." In Naples, protesters took advantage of the rubbish collection crisis to throw the debris and rubbish bags lining the streets at the doors of the regional government office. Naples 13:00 – Castello dell'Ovo occupied! Padova 13:00 – One of the two blocks [of demonstrators – libcom ed.] just got into the station! The other one is walking through Prato della Valle, in the direction of the station. Genoa 13:15 – The blockades continue: university and high school students are crossing the flyover, the bridge that links east with west, taking the motorway exit Genoa west. Rome 13:25 – The students, with their books [shields made to look like books – libcom ed.] just reached The Pantheon! Pisa 13:25 – The science faculties block has occupied the station! After blocking the major ringroad, the 4,000-strong humanities faculty is reaching the students and researchers on the platforms! Palermo 13:40 – The students keep blocking the city. Both lanes of Via Ernesto Basile are blocked. The struggle continues! Bologna 13:40 – Students keep invading the streets. 5,000 on the highway. We don't stop here, we walk back towards the centre of town to block everything! Naples 13:40 – Castello dell'Ovo is still occupied. Hundreds of students are now holding an assembly. Padova 13:45 – Now the other block has reached the station. All the platforms have been invaded by students. THE STATION IS BLOCKADED! Bologna 14:00 – Thousands continue to blockade the city. One after the other, interventions take place calling for the government to resign. And now we go wherever we like! Pisa 14:00 – About 10,000 students, researchers and precarious are occupying all the platforms in the station! The ringroad is completely occupied! We'll fight the reform! Naples 14:00 – The assembly of occupied Castello dell'Ovo calls for a new meeting at Palazzo Giusso at 17:00. Genoa 14:20 – After finishing with the flyover, the block gets down at Sampieradena and continues the street blockades. Rome 14:20 – After having a protesting outside Parliament, the block reconvenes on Corso Vittorio to restart the blockades of the city. Padova 14:30 - “We inform the kind customers that the station is occupied!” The students and researchers announcement over the station's speakers starts like this, with the sound of the mechanical voice which usually announces trains. Bologna 14:30 – The large block is walking towards the station. Genoa 14:30 – 500 continue on an imromptu demonstration; blockading the exit of the Genoa West highway. The city is split into two by the student protests. Bologna 15:00 – Very heavy repression in front of the station on the block. Tear gas has been thrown at students. The students wanted to block the platforms after having paralysed the city. Many have been injured. Two girls have been stopped and then released. Milan 15:00 – Occupation of platforms at Cadorna and Garibaldi Stations! Rome 15:00 – The 'wild' block of students got to Via del Corso where police armoured trucks have blocked the street and any way of accessing Montecitorio. The books of the Book Block are again spearheading the block! Vegetables, eggs and toilet paper against this government! Padova 15:00 – The students leave the station. Hundreds of minutes accumulated by trains. We restart the block with a soundsystem. In thousands in the direction of the centre of Padova and the Palace of Bo, the headquarters of the University Chancellor. Roma 15:30 – Block of students are charged hard on the Via del Corso!!!! The police throw tear gas at students that try to keep their block. Bologna 15:30 – The block, after the attacks, reforms itself and is again blocking the street of the city. Everyone is calling for an immediate general strike. Rome 16:00 – The students try to get to the Parliament, on Via del Corso, fights, charges and tear gas against the students. In reply: eggs, firecrackers and smoke bombs are thrown at the armoured vehicles. The block now gathers again at Piazza del Popolo! Milan 16:30 – Rogoredo station blockaded. Meeting at 17:30 in Gioia metro station. Rome 16:30 – The block of student has changed direction on Piazza del Popolo and now is going to block Torto Muro. Traffic is mad! 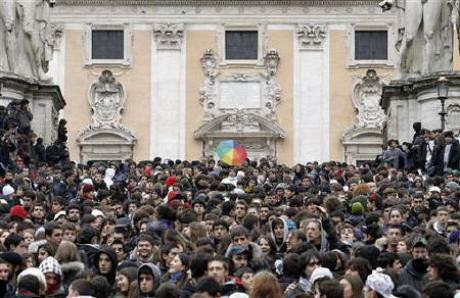 Rome 17:30 – Thousands of students occupy Termini station!!! Rome 17:30 – If they block our futures, we will block the Eurostar!!!! With this choir of thousands of students with smoke bombs and placards, arrived at the platform of Termini station! Milan 17:40 – The blockades in Milan will start. Loreto is blockaded. We start again! Palermo 17:50 – Hundreds in block from Literature, direction city of Palermo. Other blocks with the same direction, they move at the same time. We continue to blockade everything! Pisa 18:00 – Again, 10,000 after getting out from the station and having blocked Aurelia [name of a street – libcom ed.] the students invade the FI-LI-PI with the highway directions. This extraordinary day, nothing stops us! Milan 18:20 – Police charge on one of the three blocks that are locked in Santa Sofia. Now the blocks restart. Different people have been stopped. Milan 18:30 – The students calls for a public block. Gathering at 20:00 in Palestro! Rome 18:30 – Students get back into the occupied faculties at La Sapienza university. Just the time to decide what to do to continue this mobilisation! Palermo 19:00 – Street blockades all over town; ALL OF THEM [police – ed.] HAVE TO LEAVE! Pisa 19:00 – The spontaneous blocks gets onto the A12 highway, blocking the entrance to central Pisa. The police can't do anything except watch! They can't stop us! Palermo 19:00 – The number of students on the streets increases, traffic is paralysed. Street blockades between Corso Vittoria and Via Roma. Let's block the reform, let's block the city! Milan 19:25 – No one has been stopped in Milan. But the students kept being held up in Santa Sofia by police outside. Rome 20:15 – With 307 'yes' and 252 'no', the Gelmini reform has been approved in Parliament. But we don't stop. This is only the beginning. The government will fall apart before the law comes back to the senate! Palermo 21:00 – Occupied the town hall of Palermo and blockaded the town assembly. The students have called for an assembly at the town hall at 21:30. Milan 21:00 – The block leaves Palestro towards San Babila. Santa Sofia occupied. Blockades continue. People like us will never give up!!!! Milan 21:30 – Heavy rain, the block finishes in San Babila with the Santa Sofia faculty occupied. Milan is blockaded by the barricades done by the different student collectives. So this will have to do for now. When my girlfriend gets back this evening, we'll have a go at that uniriot page..
Also, depending on my timetable tomorrow I might try to head down to the university to see if there's anyone I can talk to (with my shitey Italian or, hopefully, with their English!).. Italians don't play: Bologna looks mad..
D-Day for the education system in Italy. The reform packet being proposed by Education minister Maria Stella Gelmini goes before the lower house of parliament today and the entire country is braced for the culmination of demonstrations being held by students to protest the measures. The centre of Rome around the parliament buildings is completely blocked off by massed police and carabinieri in riot gear as the student march makes its way towards Piazza Montecitorio from the Sapienza University. But there are also several other marches in progress. Many other Italian cities are witnessing mass student action, too. In Palermo, school and university students have announced a "Block Everything Day", with marches and sit-ins designed to bring the city to a halt. In Turin, the students are marching from the university, together with junior high school students, while other students are picketing the Polytechnic. Following another demonstration yesterday evening when they blocked roads and egged the offices of the employers' federation, students in Genoa are again on the move today. The earthquake-struck town of L'Aquila has also been the scene of massive protests by students. Three faculties are currently occupied and the protests continue today. Hundreds of students are marching in Milan in 8 different demos, with others blocking critical access points to the town centre and occupying the main train station. Yesterday the faculty of political sciences was occupied. The faculty of literature and philosophy at Naples university was occupied yesterday and students there are also marching this morning. Other protests are under way in Ancona, Brescia (where police have attacked the demos), Bari, Siena, Cosenza, Pisa and Venice. In most of these cities, students have been occupying faculties and making roof-top demonstrations over the past few days. Here's an update from today's mass protests against the university reform bill. Sources for this information are mostly mass media, but it will serve to give an idea of the scale of the demos. 5.000 students (junior high/university). Cathedral occupied. Police cordon off access to the port where hundreds of students are heading. Students enter the state TV offices demanding the possibility to speak on air. The regional government offices are briefly occupied by students and researchers. Economics faculty occupied. Riot cops clash with students. A 15-yera-old is arrested. Several thousand students marching in the town centre. The Petruzzelli theatre is occupied. Student say they will block the city as their future is beling blocked. One of the city's main roads is blocked by several thousand students. Police charge protestors, with some light injuries. The Ducal Palace is briefly occupied. Entrance to the motorway is blocked by students. Casual workers and students from university protesting along the Grand Canal. Trains blocked at the station. Eggs thrown at the Catholic University. A small group of students tries to storm the city council offices. Clashes between police and protestors with police batonning students. A hundred or so researchers occupy the roof of the Bicocca University and Greco train station. Police close 3 underground stations. Police cordoned off train station, preventing occupation. Over 5,000 students block entrance to the motorway and occupy part of the road. A load of manure is dumped outside the local offices of the government party, the PdL, with a note saying "This is for 16 years of government". Clashes between protestors and students at the station. Student demo blocks train station for over an hour. The students had spent the morning marching through the city, with traffic completely blocked. Around 10,000 students marching in the rain, blocking the centre. Students try to occupy offices of the education ministry. Access to the city's ring road is blocked by protestors. The second group of protestors occupies the train station. Students protesting on the Capitol Hill outside the city council offices. Thousands of students on the march towards the parliament buildings in Palazzo Montecitorio. Streets in a wide radius are cordoned off, with even pedestrians denied access. Face-off starts between students and riot cops, with vegetbables and eggs thrown at police. 5 high schools are under occupation in solidarity with universities. Students continue to march around the centre, attempting to reach Montecitorio. The entire city, including the riverside is paralysed. Police use tear gas against students who are trying to overturn a police van and then charge them with batons. Some arrests are made. The faculty of geology at Sapienza university is occupied. Around 10,000 students blocking the centre with a march to protest the reforms. Several hundred high school students blocking a bridge, one of the cities main arteries. They are trying to reach the train station to occupy it. Students occupy university radio office and transmit a debate on the reforms. Several hundred students block the Salerno-Reggio Calabria mortorway. Agriculture faculty occupied. Students holding assemblies. Another wildcat demo brings the city to a halt. Railway station occupied by about a hundred students and university researchers who broke away from the main march. Train station occupied for about an hour. Train station occupied by over 2,000 student protestors. University occupied since last Wednesday. Students hold a mock trial of 10 Sardinian intellectuals (including Gramsci), charged with "promoting culture". Students occupy train station, blocking the lines. Thousands of students march through the city centre, bringing traffic to a halt. One main bridge is occupied. A figure representing "Research" is ceremoniously executed by firing squad during protests by students, lecturers and researchers. The Roman amphitheatre is occupied by several thousand junior high and university students. Traffic brought to a halt for the whole morning. Italian students raise a banner against the reforms on the Arc de Triomphe. Bump. Added uniriot translation to the main article..